Beth Burns is a fiber artist and retired Fisheries Biologist who has lived on Roanoke Island for over thirty-six years. Beth works with a variety of natural fibers and has a preference for superfine threads (silk, wool, cotton, linen, tencel, bamboo). A fascination with wool has naturally evolved to the incorporation of felted fibers into some of the handwoven works, and nuno felting with silk and merino wool. Most recent creations incorporate eco-printing; a natural dying technique where plants are printed onto the felted wool or silk fabrics. All work highlights uniquely dyed yarns and silks for original work and true pieces of wearable art. Beth especially loves to utilize wool from her own small flock, which in addition to beautiful fleeces, provide daily purpose and peace. 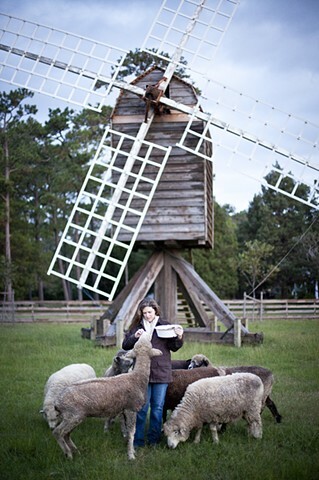 The flock resides at Island Farm, Manteo, North Carolina, currently consists of Merino and Romney sheep, and provides flexibility in available work.